Nagarhole National Park, one of South India's well-protected wildlife sanctuary, is located in two districts of Kodagu and Mysore in Karnataka. 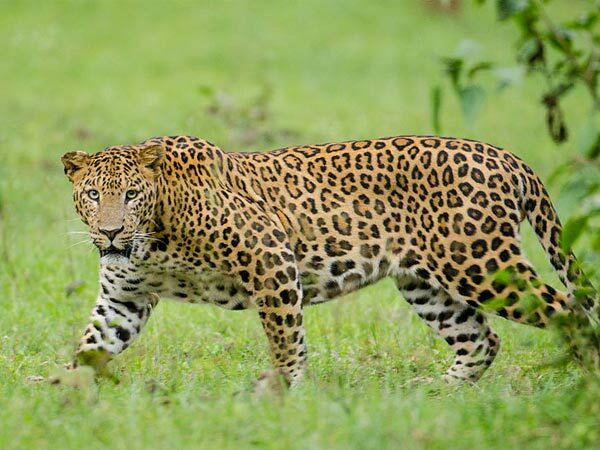 Also known as Rajiv Gandhi National Park, it is a part of the Niligiri Biosphere Reserve, with the neighbouring Bandipur, Mudumalai and Wayanad National Parks forming the rest of the reserve. It runs across the ranges of the Western Ghats on Brahmagiri Hills, and is located northwest of Bandipur National Park. The two parks are separated by Kabini Reservoir. The name "Nagarhole" comes from two words, i.e, Naga which means snakes and hole (pronounced ho-lay) meaning stream. With streams, valleys and waterfalls, Nagarhole is a beautiful National Park protecting endangered wildlife species, mainly Elephants and Tigers. The ideal time to venture into this National Park is between the months of October to May, during the winter and summer seasons. In monsoon, going on treks or safaris might get difficult due to the unpredictable rainfalls. Here are the places to visit on the way to the Nagarhole National Park. Ramanagar district is well-known for housing tall hills of granite. Located roughly 50 km from Bangalore, Ramanagar was earlier called as Closepet. This town is famous for one too many reasons. One, the rugged terrains of the hills such as Ramadevara Betta and Siddeshwara Betta are popular spots for trekking and rock climbing. Two, these hills received fame since the blockbuster hit movie "Sholay" was shot on these hills. Three, the scanty vegetation of Ramanagar hills is a habitat for some of the most endangered species such as, long-billed vultures and yellow-throated bulbuls. Therefore, a stop at Ramanagar is ideal since it has something for people with all kinds of interests. The town of Maddur is located about 35 km from Ramanagar. It happens to be one of Bangalore's favourite long-drive destination since it is a short drive that takes you out of the city. People stop here for the town's famous "Maddur Vade", a delicious snack made of semolina and onions. Between Maddur and Ramanagar, lies the toy town of Channapatna, where you can stop and buy attractive lacquered articles made of wood. Srirangapatna is a town in the district of Mandya, and is located 78 km from Ramanagar. It is a culturally rich town of Mandya with many tourist destinations. A Mughal emperor from history - Tipu Sultan's presence can still be strongly felt with all that what remains in the town today. Daria Daulat Bagh is Tipu Sultan's summer palace, supposedly his favourite place of retreat. The palace is now turned into a museum with paintings and murals for display. Gumbaz is the burial place of Tipu Sultan and his parents. It is a fine portrayal of the Islamic architecture; the Gumbaz is a beautiful dome made of ivory, built on his burial ground. A haven for bird-watchers, Kokkre Bellur is mainly known for being home to Painted Storks and Spot-billed Pelicans. The beauty of this bird sanctuary is that the villagers and the birds co-exist with absolute nonchalance. The locals maintain tamarind trees for the birds, and eagerly wait for the migration ever year since they believe the birds bring good luck with them. November to June is the best time to visit Kokkre Bellur. Located at a distance of 63 km from Kokkre Bellur, Ranganathittu is the largest bird sanctuary of Karnataka. It is a much more diverse bird sanctuary that houses different species such as Black-headed Ibis, Indian Shag, Egrets, Painted Storks and more. June to February months are ideal to visit Ranganathittu. Read on to know about Nagarahole National Park and places nearby. Nestled in the foothills of the Western Ghats, Nagarhole is located almost 96 km from Srirangapatna. This enrapturing park is abode to birds, animals and trees of various species in abundance. Animals such as Bengal Tiger, Indian Leopard, Four-horned Antelope and Golden Jackal can be found here. You might also witness birds of different degrees of endangered species such as Nilgiri wood Pigeon, Greater White Ibis, Red-headed Vulture, Blue-winged Parakeet and many more! The Safari charges for Indian Nationals is Rs 300 and for Foreign Nationals, it is Rs 1100, for each person. The Safari timings are from 6.30 am to 8.30 pm in the morning, and 3.30 pm to 5.30 pm in the evening. The Safari lasts typically for an hour. We advise you to call and find out about the Safari availability with the Forest Department in advance as it tends to get cancelled on the account of a bad weather sometimes. Iruppu Falls, also known as Lakshmi Thirta Falls, is located in the Kodagu district of Coorg, about 24 km from Nagarhole. Huddled on the Brahmagiri Hils, the fresh waterfall is an enthralling sight, surrounded with green patches and a rocky landscape. Best time to visit Iruppu Falls would be the monsoon, when it is brimming with water. Rameshwara Temple found on the way to Iruppu Falls is a famous pilgrimage site. It is usually crowded during the Shivarathri Festival.